Tired of spending hours on end fiddling around in Lightroom and not getting the results you know you should be getting? This book will show you how to use Lightroom Classic to its full potential; not by droning repetitions of someone else’s editing style, but through teaching you the basic premises of the software using easy to understand, real-world language that will unlock your potential for learning. Post-processing your digital photos is an integral part of the photographic experience. Your photographic experience. The digital photo which is left unprocessed is akin to a roll of film left in its canister, undeveloped and unseen. Every photograph you have ever seen has either been developed in a darkroom or processed digitally, or both. We have designed this ebook to look great on many devices and offer a comfortable reading experience. The included PDF is perfect for reading on your desktop computer or tablet. This ebook is broken down into 17 chapters that contain over 230 pages packed to the brim with knowledge, advice, tips & tricks, and training material to help you become a master of Lightroom Classic CC. Start making sense of all those sliders; learn to use Lightroom Classic CC like a pro! Learn everything there is about the tools, panels, and modules in Adobe Lightroom Classic CC. Learn about the brand new Creative Profiles now available in LR Classic! You'll even learn to use the Map, Book, Slideshow, Print, and Web modules! Don't take our word for it. Here's what people have said about the Lightroom Mastery eBook. Lightroom Mastery contains a total of 17 chapters (that's over 230 pages.) Below you'll find the complete list of chapters in the ebook. Complete with screenshots and example photos, this ebook, by award-winning photographer and author Adam Welch, will guide you on your Lightroom Classic journey. 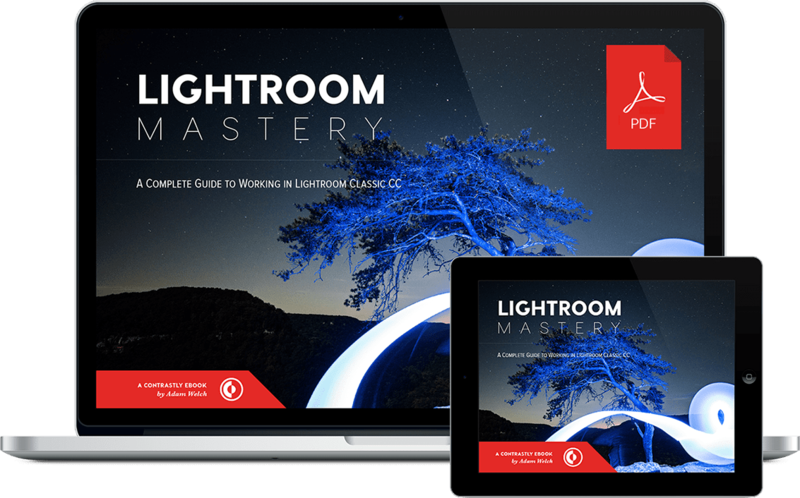 Now is the time to invest in your photographic and post-processing education... get the Lightroom Classic training you deserve with the Lightroom Mastery ebook. What software do I need to read the Lightroom Mastery ebook? First of all, you definitely should have Adobe Lightroom Classic CC (the desktop-based version of Lightroom) installed on your computer since that's what this ebook is about! This ebook comes in PDF format – thus any PDF reader application will work just fine. Can I read this ebook on any device? What happens when there's an update to Lightroom? When Adobe releases a major update to their Lightroom Classic CC software, we'll update the ebook with the latest information and notify you when the updated Lightroom Mastery ebook file can be downloaded (we won't cover minor updates and bug fixes, only major updates and changes).